For Yamaha Generator, Pump, A TV, snowmobile, motorcycle and marine vehicles. When do I service my machine? 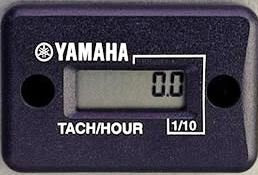 Yamaha engine meters or hour meters are a great way to keep track of service intervals as they flash first at 10 hours, the initial break in period then at 50 hour regular service intervals thereafter. The flashing hour meter is a reminder to service your machine with an oil change, valve adjustment, spark plug change, etc. The meter has a tachometer function used at tune up time to set the correct idle setting. Installs with a peel and stick velcro pad. Easy to read even in bright sunlight and inexpensive. Contact info@yamahagenuineparts.com for generator parts, we quote and ship to your door.